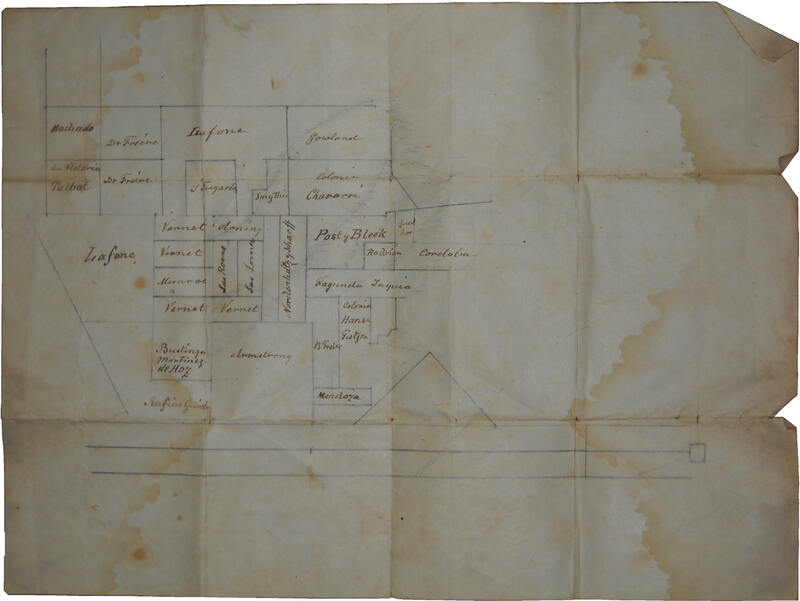 We will be continually updating the maps and list of names while we transcribe the Benitz family records of the activities that took place at estancia La California, Santa Fé, Argentina. These include Alfred's diaries prior to 1884, and all the surviving La California day-books. We welcome corrections, further information, or suggestions; so please e-mail or call us. Our addresses can be found at foot of the Benitz.com opening page. Reproduction of the wall map that hung in the office. Redrawn from photos of the original after it was damaged. People are listed by their surnames then their first-name (if both known), followed by their titles (Cacique, Capt., Comandante, Don, Mr., Sr.). People may be listed twice for the diary entries don't always provide full names, in particular of those people the writers are very familiar with, especially the workmen. Therefore, when searching for a person, search separately for both the person's first-name and surname. (1888 Feb) - Many entries are followed by one or more dates in brackets. These dates indicate the first month in which a name is found in a La California day-book of the year shown; and, if the year is prefixed with an "A:", it indicates an Alfred diary, e.g. (A:1877 June); and, if prefixed with an "F:", it indicates a Frank diary, e.g. (F:1876 July). [H] - Some entries have an [H] appended to denote a "Hermanism". Herman V. Benitz often spelt phonetically, with interesting results. We suspect he was dyslexic. 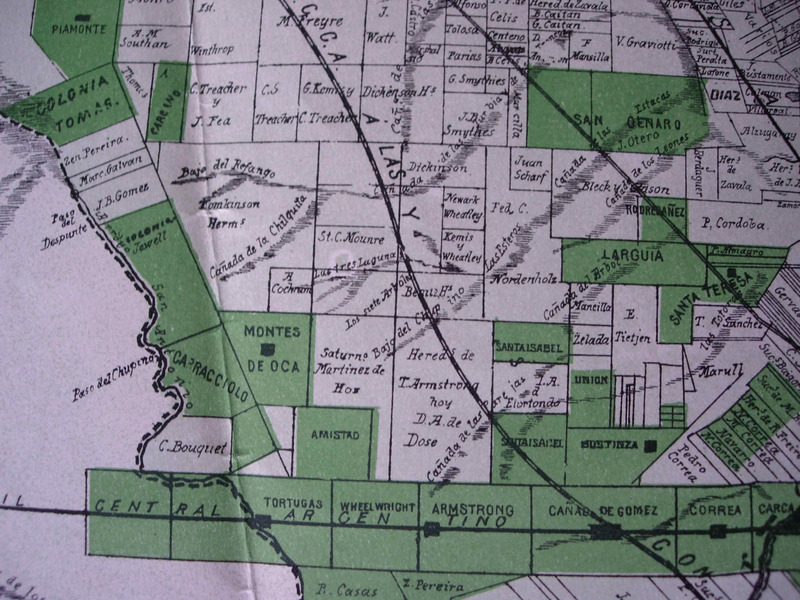 Estancia once owned by Thomas Thomas (on the above map of 1889: area labelled Colonia Tomas in top-left corner). Management overseen for the Thomas family by Alison Hall. (A:1877 June) Workmand at LaCal., mentioned often. (1899 Memoranda) Address listed, Ireland. (1899 Aug) was sent hay. Respected agricultural implement supply company in Argentina. Founded in 1884 by T.F. Agar, Malcolm Cross, and others. The company distributed many leading brands, the best known is the “Aermotor” windmill; for pumping water, made in Chicago. Agar Cross sold over a millon of them in Argentina; many are still running on estancias today (2010). Reorganised in 1967 as a supplier of agricultural chemicals and fertilizers. (1890, 1891 Memoranda) Listed, BA address. (1899 Jan) Peón, capataz? a.k.a. : Igenio? (F:1876 July) Condolences, in association with “Deutsche La Plata Zeitung”. Estancia located south of Monte Buey in the SE quarter of Córdoba province. Bought by Benitz Hermanos for Johnnie in 1896, it was 3½ (old) leagues in size (10,125 has. or 4.05 metric leagues). See her bio pages: Clara Electa Allyn (1858-1930); wife of William O. Benitz. (1888 May, 1890 Jun, 1891 Jan) Worker at La California. (1890 Jan) Pulpero (publican) on or near to La Cal. He was supplied beef for his store, several head a week. Replaced Peter Mar. 23, 1890. (A:1877 May) puestero at LaCal. (1890 Feb) Colono? at La California. 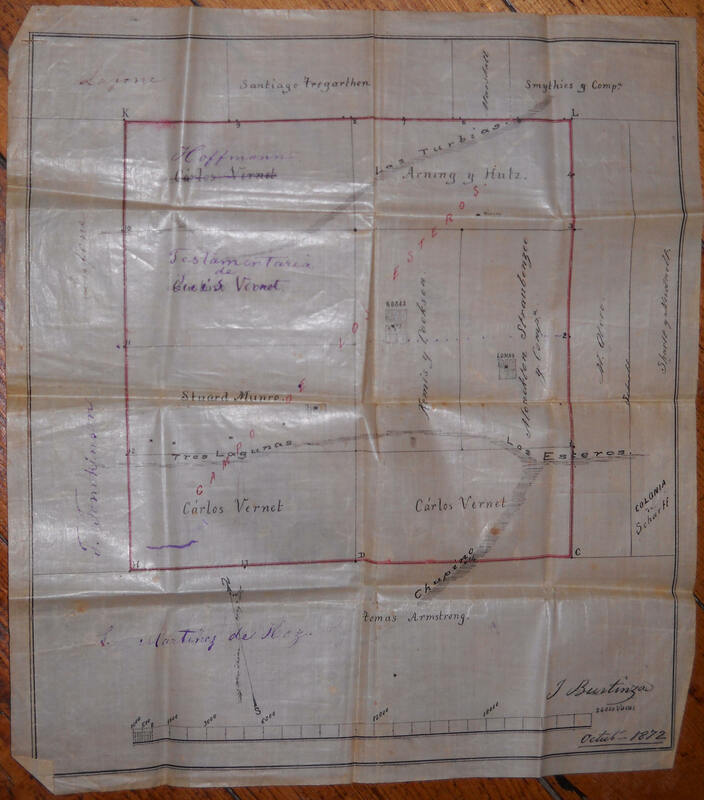 Estancia next to & north of Las Rosas town, 4 leagues, bought by David Gómez from Vernet ca.1874; still exists. Town in Santa Fé, west of Cañada de Gómez on the F.C.A. railroad between Rosario & Córdoba cities. (1890 Feb) Workman at La California. (1888 Jan) Trusted workman at La California. Killed opponent in knife fight during a workmen’s baile (dance) at La California. (1888 Mar) Grain buyer. Bantle family owned / owns a large tract of land directly west of Las Rosas, against the provincial border with Córdoba, it surrounds the town of Bouquet. (1899 Oct) Bought horses (Of Rosario, see card). (1899 May) Of Cañada de Gómez; bought horses. (1890 June) Hunted at La California. (1888 Feb.- Mar) German photographer, took pictures of La California. The department (county), in Santa Fé, of which Las Rosas is its seat. (1890 May) Town in Córdoba, west of Cañada de Gomez on railroad line between Rosario and Córdoba city. See Johnie’s diaries for more details. See his bio. pages: Alfred Alexander Benitz (1859-1937). He was the 8th child of Wilhelm & Josephine Benitz. See his bio page: Herman Vitalis Benitz (1863-1893); he was the 10th (youngest) child of Wilhelm & Josephine Benitz. Made entries in the La California day-books (1890-1892) when John was absent, very poor spelling. Fourth child of JEB, born (1901) after his parents moved to Los Algarrobos (1899). See his bio pages: John Benitz (1901-1975). He had no middle name. See his bio pages: John Edward Benitz (1861-1916). ; 9th child of Wilhelm & Josephine Benitz. He married Marjorie M. Macitosh. Mentioned regularly in the day-books of La California, which he managed from 1884 to 1899. He wrote most of the entries during those years; he always refered to himself in the third person as: Johnie. See also: Macintosh, Miss M.
See her bio pages: Marjorie Morris Macintosh (1858-1945); wife of John E. Benitz. Son of William O. Benitz. See his bio pages: William Agar Benitz (1888-1956). See his bio pages: William Otto Benitz (1854-1911), he was the 6th child of Wilhelm & Josephine Benitz. He married Clara E. Allyn. (1890s) Listed in the Memoranda of the La California Day-Books as: “Benitz, G” with a Gualeguaychú address. (1890s) Mentioned regularly as William. The company formed between the brothers Alfred, John, and William (AAB, JEB, WOB) in which they pooled all their property (land & livestock). Per Alfred’s biography, it was founded 8 March, 1897, after their mother and sister had taken their shares in the form of cash. The company likely existed a very short time, at most a year. However, we are not sure when it was dissolved; per its constitution, it was to exist for 5 years, i.e. until March, 1902. When it was split up, Alfred received Las Tijeras, the western league (1⁄3) of La California, and all the livestock (more than 15,000 head) held on the rented camps in north Santa Fé (Los Palmares & others), John received Los Algarrobos (4 leagues), and William received the two eastern leagues (2⁄3) of La California, including its casco (headquarters). Common misspelling in English of Bohtlingk, particularly by Herman Bz. (A:1877 June) Mentioned. See negra /o. (F:1876) Mentioned, in Rosario. See Mr. Davies. (1888, 1890, 1891 - often) Owner of estancias Las Chilcas (NW of LaCal.) and Santa Clara (east neighbor to LaCal. that until 1886 was part of La Germania). Apparently a great friend of the Benitz family for they visited each other frequently. In 1874, the Böhtlingk family (from Germany) arrived in Arg. on the same ship (S.S. Boyne) with the Benitz and Schiele families. (1890) Town on the rail-road spur west out of Las Rosas about 20 km., beyond Iturraspe, close to the border with Córdoba. See maps at top. (1891 Mar) JEBz visits, near Tortugas - see maps above. (1899 July) In an address, Córdoba. (A:1877 May) Segundo/peón at LaCal. (A:1876 Sept) Peón at LaCal. The largest & richest province of Argentina, it surrounds the city of BA. La Plata is its provincial capital, on the coast about 55 km. south of BA city. (1890 July) – Estancia 30-35km. NW of Las Rosas (or 7km. east of Piamonte), at the time owned by David Carmichael Munro. See maps at top. Estancia founded by Wilhelm Benitz in 1875 – see its description & history; also, see maps at top of this page. Train station, often referred to as “the station”. (1888 Apr; 1890 Aug) Peón at La California. Jailed 20 Oct’90. C. de Gomez, C. de G.
Abbreviation for Cañada de Gómez. Important town (department seat) 30 km. south and a little east of La California, approx. 70 km. west of Rosario on the F.C.A. railroad to Córdoba city. Until 1889 when the raidroad through La California & Las Rosas was laid, Cañada was the closest train station where goods & mail could be received & shipped. See maps at top. Store in Calchaquí – see names for North Santa Fé. (1890 May) Town 45 km. west of Rosario on the F.C.A. rail-road to Córdoba; where the railroad crosses the river by the same name. See maps at top. aka: The Cardo. Estancia Los Cardos (the thistles) is about 20 km. north of Las Rosas where a RR station was built by the same name. The town was founded in 1928. See maps above. (1901 Feb) Received rams, Rosario. (A:1877 May) Estancia, owned by the Dickinson brothers, 1880's & 1890's. Home of Alfred Dickinson & some of his sisters in the 1890's; possibly owned at one time by Tregarthen. See maps at top. (A:1877 June) Baile, Alfred did not attend. Town about 30 km. NNE of La California on the main rail-road to NW Argentina - see maps above. (1890 Nov; 1891 Jun) Cattle buyer / butcher. In the context of the diaries, refers to the Gran Chaco climatic / geographic region that encompasses north Santa Fé, north-east Santiago del Estero, and all of the Chaco and Formosa provinces. Ea. Los Palmares was in the Chaco region of north Santa Fé. (1899 May) Provides firewood; visits. (1888 June) Visited with surveyors, for the rail-road? (1888 Oct) Visited with Mr. Fea. Located 30km. NE of LaCal. See maps at top. (A:1876 Sept) Unclear mention, at LaCal. Later: horse tamer. Estancia established by Bohtlingk, its south-east corner met the north-west corner of the original La California. Lies east of the town of Iturraspe, about 5-10 km. west of current town of Las Rosas and much of it is still owned by members of the Bohtlingk family descendants. (Split up July, 2011) See maps at top. (1890 Jan) – Visited, see Schiele. (1890 Apr) Town at the foot of the Andes, northern Neuquen province. (1890 Jan) – Stayed on several times. Estancia south of La California, originally belonging to Armstrong? See maps at top. (A:1876 Nov) Held rodeo to part out their cattle. (A:1877 July) Held rodeo for them. Likely an area of colonos (sharecroppers) on Las Chupinas. (A:1877 June) Person or estancia, 2 leagues north. (1890 May) Workman at La California – “pulled water”. (1888 Apr) Alternative spelling for Calistro? (1891 Jun) Supplied wood from Córdoba. (A:1876 Sept) Stopped by going to Las Rosas. (A:1877 June) Mentioned. Lives within ½ day’s ride of LaCal. 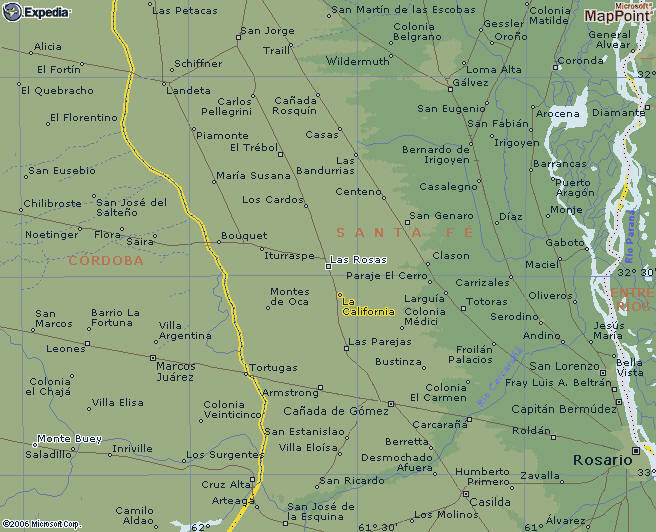 Argentine province bordering the southern 2⁄3 of Santa Fé province on the west. Its capital, Córdoba city, is about 700 km. NW of Buenos Aires. The province is named after the city which dates from colonial times. It’s western half is dry and mountainous, the east half flat. The SE quarter lies within the pampa humeda – the agriculturally rich humid pampas. (1899 Nov) Headmistress, Las Rosas school for girls - invitation to graduation. (1888 Jan; 1890 Jan; 1891 Jun) Visited Jan. 6 – 27, 1888. 1 son, 1 daughter. Several later visits, friends of the Macintosh’s. (A:1877 June) Important town on the Paraná river, midway between Rosario and Santa Fé city, 90km. NE of LaCal. See maps at top. (1890: Sep.30) Cattle buyer from Rosario; w/ Ricardo Frontera ? (1888 Jan) Founder of Agar Cross, & Co. – important farm/ranch supply company in Arg. He married Bernice Avery (from Rochester, Minnesota, USA) at La California on 19 January, 1886. Bernice was a good friend of Clara E. Allyn (wife of WOBz) and like her was one of the school-teachers invited to Argentina by President Sarmiento. The name of an arroyo (creek), a locale on that river, and of John E. Bz’s summer home in that locale, in the Sierras Chicas north of La Cumbre, Córdoba. When not qualified, most likely John's summer home. For more details & maps, see "The Hills" People & Place Names. (1890 May) Brings & takes cattle for Kemmis. (1899 May) Mentioned; bought cattle. (1888 Feb) Bought livestock from La California. (1888 Oct) Very ill – typhoid? See Dr Frend. (Oct. 30) Died at La California. (1890 Nov, 1891 Sep) collected cattle. Mayordomo at the Rafango. (F:1876) Mentioned, in Rosario. See Blyth. (1890 Jul, 1901 Feb)) Town approx. 45 km. west of LaCal., on railroad trunk line from Rosario to NW Arg. See maps at top. (1891 Aug) probably Henry A. Dickinson, b. Aug. 1889. (1890 Jan) Visited on several occasions. Dickinson, Herbert & Alfred D.
From England, they owned estancia Las Lomas. They also founded the town of Las Lomas (1888) which was later incorporated into Las Rosas (1892). Their niece, Olga B. Horner, married Alfred, 1915; their sister Gertrude married Edmund Traill. (1888 Mar; 1890 Oct; 1891 Apr) Visited. (1888 Mar) Colono at Las Tijeras? (1888 Jan) Cook at La California became ill.
(1888 Feb) Bought cattle from La California. (1890 July) Might be humorous reference to Donkin. (1888 all year, 1890 Jan) First Visited, Feb.23 1888; moved there on Mar. 16, worked there sporadically (segundo?). Comes & goes. See Los Palmares day books. (1899 May) Colono? Bought pigs. (1899 Nov) Called w/Mrs. Böhtlingk - bought horses. (F:1876 July) Mentioned, see Mr. Kinkelin. (A:1876 Sept) Servant at LaCal, helps Alfred milk cows, do chores (& a bit more). (A:1877 May) Met at estancia Las Rosas. (1888 Oct., 1890 Jan, 1891 Feb) Visitor at La California. Province east of Santa Fé across the Paraná river. It’s capital, Paraná, is directly east of Santa Fé city. (1890 Sep) Large estancia east of Cañada de Gómez. Herman & Johnnie attended horse races there. Town and river in northern Santa Fé province. See Alexandra, Los Palmares, and Frank (F.J. Benitz), & Alfred. (1888 Jan; 1890 Jun; 1891 May) Worker at La California. (1890 Jan) Visited, brought tennis balls! (1888 Jan) Temporary replacement cook at La California. (1890 Dec) Mayordomo of Colonia vieja, reviewed fields for pasture. Represented the company Bunge & Born in Rosario. (1890 Oct; 1891 Sep) Mentioned. Banker? (F:1876 July) Capataz at LaCal. (A:1877 May) Capataz, mentioned often. (1888 Dec) Died at La California. Likely Farias, the family worked many years at La California. (1888 Mar) Visited from Las Parejas. By mid-May, 1888, was working at La California.. Bucked off and badly hurt, May 26. (1888 Oct) Visited with Chapman. (1890 Apr) Workman at La California. Wide gauge railroad built 1863 - 1870 by William Wheelwright (North-American with British capital), it joined Rosario with Córdoba city, passing through Carcarañá, Cañada de Gómez, Armstrong, Tortugas, Bell Ville, and Villa Maria. In 1908 the company absorbed the BA to Rosario line. Nationalized in 1949, it became part of the Ferrocarril Nacional General Bartolomé Mitre (F.C.N.G.B.M). Privatised during the 1990's, it became part of the Nuevo Central Argentino S.A. (N.C.A) — for more, see Wikipedia or search for other cites. (1899 June) Sold alpacas to LaCal. (A:1877 May) Town in Córdoba province, (Translation: “Dead Friar”). Later renamed Bell Ville in honor of the Bell brothers who fought off the indians. Became mayodomo for AABz at Los Palmares, March 1893. (1890 Jun; 1891 Nov) Visited. (1890 July) Resero from Córdoba. (1888 Apr) Colono at Las Tijeras? Frank Joseph Benitz (1850-1881) – see his bio. pages; 4th child of Wilhelm & Josephine Benitz, brought near ruin to the family. Franz Xaver Benitz (1816-1880) – see his bio. pages; younger brother of Wilhelm Benitz. (1888 Oct) Visited. Apparently Mr. Daniels was the patient. See curious note Dec.25, 1890. (1890 Sep) Cattle buyer w/ Pedro Corta. Stayed the night. (1888 Dec) Worker hired at La California. (1888: Often) Large estancia (15,000 ha) bordering La California to the east, bought by Federico Nordenholz in 1864. In 1886 he sold the southern 2(?) leagues to Edmundo Bohtlink; it became Bohtlingk's Santa Clara. In 1938, El Orión came into being when the next 2(?) leagues were split off by Nordenholz's 2 daughters - his son kept the original casco (HQ) and the 2(?) northern leagues. (1897 Sep) Became mayordomo at La California, $100 per month. Previously at estancia “Chirú” (see Mr. Traill); later at Las Lomas. (F:1876 July) Letter of condolence. Husband ill, owner of Restaurant Hamburgo, Rosario. Don Guillermo - see Willie O. Bz. (1888 Mar) Owner of cattle that stayed the night. (1890 Mar) Workman? Left for Santiago. (1899 June) Send maize to grind. Willie’s (WOBz) summer home in Los Cocos, Cba. City on the Uruguay river in the SE corner of the province of Entre Rios; south of which Willie (WOBz) managed an estancia for the Hope family and /or the Bunge family. (1888 Mar) Worked at La California. (1890 Sep) Renter / tenant farmer at La California. (1899 Jan, 1901 Feb) see Benitz, William O. (1890 Jan) Builder / handyman at La California. Mentioned often. (1891 Jan) ditto; fired 22 Sep., drunk. (1888 Apr, 1891 Mar) businessman in Rosario, hides? (1891 May) Visited to hunt. (1890, 1891 Memoranda) Listed, Rosario address. Estanciero, from the U.S., with 18,000 has. near Arias, Córdoba. (1890 Jul; 1891 Jun) Visited, stayed the night. 1890 June) Stuck in cañada, shooting. (1890 Sep; 1891 Mar) Visited - from 51 & Arroyo Seco. (F:1876 July) Owned by Glimmann; Frank stayed night. (F:1876 July) Mentioned. Colonia SE of LaCal. (near today's Bustinza), on Ea. “La Hansa”, both owned by the Engelberto & Woltje Tietjen., German consuls in Rosario. See maps at top. Also owners of saladeros and responsible for introducing hares into Argentina! (F:1876 July) Lunched with in C.de G.
(A:1876 Oct) Lunched at in C.de G.
See her bio page: Hattie B. Benitz-Watt; eldest child of Willie & Clara Benitz. (1890 Mar) Mentioned; (Sep) Traded ponies with Kemmis. (1890 June) Visited, polo player? Goes to C. de G. for tournaments. (1890 Aug) Sold barley. Payment made to Heiland. Owned a distillery west of Cañada de Gómez (ruins of the old chimney visible north side of Ruta 9) & bred pigs. (1888 June) Mentioned – paid for pigs? (1899 Feb) Visited - horse breeder? (1890 Sep) Workman, for Kemmis ? also: Hickatier, Hickitier – Mayordomo (nanager) for E. Bohtlingk at estancia Santa Clara. (1888 July) Stayed the night. (1890 Mar) Passed through with herd of cattle; stayed the night. likely the co-owner with Thomas Thomas of the Hill & Thomas flour mill in Carcaraña. (1896 Sept) Became mayordomo at La California, $150 per month. (1897 Jan) Mayordomo at La California, until Sept.'97. Returned to England. (1888 Jan) Possibly refers to the Hope family for whom Willie (WOBz) managed an estancia near Gualeguaychú. Mrs. Hope came to Argentina from the U.S. as a school-teacher, invited by President Sarmiento, same as Clara E. Allyn, Willie’s wife. (1890 Memoranda) Listed, Rosario address. (1899 June, 1901 Feb) Stallion. a.k.a. “Auntie Olga”, “Chitti”. Married Alfred, 1915. First cousin of the Dickinsons (Ea. Las Lomas) and Traills (Ea. Chirú). (1890 Apr) Brought herd of cattle. 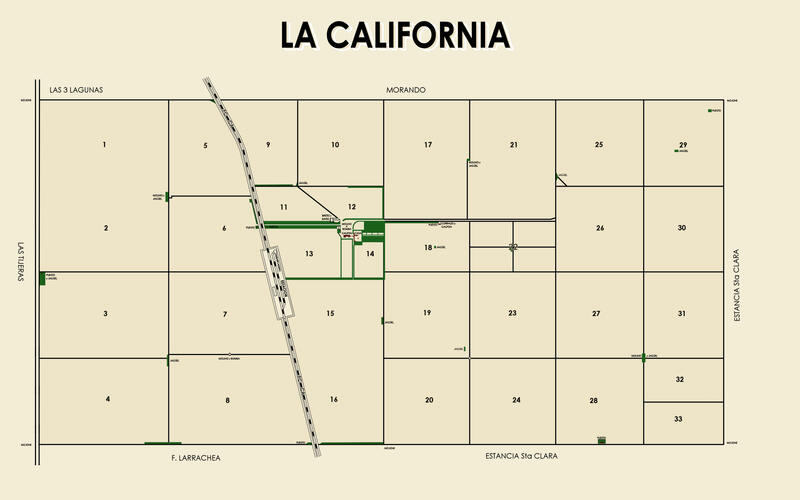 West league of the original La California, beyond Las Tijeras. Its NW corner met the SE corner of estancia Las Chilcas. Populated with colonos, it was sold in 1881? to Smythies to pay debts incurred by Frank (Frank J. Benitz). (1899 Jan) Los Algarrobos peón, capataz? a.k.a. : Aginio? (1890 Apr) – see El Injerto. Estancia near Carlos Pellegrini – town approx. 50 km. north of Las Rosas. See maps at top. See Mr. Roberts. (1888 Feb., 1890 Mar) Worked at La California. (see also Isidro Sosa). (A:1877 June) Postmaster? at C. de Gómez. (1890 Jun; 1891 Jul) From Carcaraña, pig buyer? See Benitz, John - father or son per context. (1890 Sep) Likely German – see Germán. (1899 Apr) Mayordomo as of 29 April, 1899. (1899 Apr) Likely a pedigree bull, died. Son of JEBz, born 1901. See Benitz, John - no middle name. (1891 Jan) See Johnston, Mr.
(1888 Often) Worker at La California. [Discharged Feb.11,1890 – still there months later.] ; see Jose Gorosito. (1899 Apr) Mentioned. Estancia & colony where the town of Bouquet is today (20 km. east of Las Rosas). Owned by the Jewell family (joyas is jewels in Spanish) & managed for them by Frank Kinchant (he later managed Las Petacas for them - see both). (1899 Feb) see Johnnie Bz. (1890 Aug) Peons cook, discharged. Judson, Dr. / Mr. & Mrs.
(1899 Dec) Grain supplier? Possibly Julio Delgado. See her bio pages: Katie Benitz-Jeans (1884-1963); second child of Willie & Clara Benitz. From Xxxx, England, owned neighboring estancia Las Rosas (186x-1899), north of La California and west of Las Lomas. In 1890 he founded the town of Las Rosas. He is mentioned often in Alfred's 1876 & 1877 diary, and in the early LaCal. day-books: 1888-1890. May have gone bust, sold out in 1899. See maps at top. (F:1876) Carpenter at LaCal. Travelled with Elisa. (1899 Nov) Insurance co. man, called. (1888 Mar) A business entity? (1890 Mar) Visited. Died June 10. (A:1877 May) German living/working at La California. (1890 Apr) Company in Cañada de Gomez. (1890 May) Town 50 km. east of La California, on main railroad from Rosario to NW Arg. (A:1877 May) Neighbor, "bossed" the first marcación at La California. Owner of a large estancia to east of La Germania and Scharff. See maps at top. (1888 May) Referenced. (1890: Mar) – Josephine & 2 Miss Macintosh visited them. (1890 Nov; 1891 Apr) Visited. (1890 July) Town, in Córdoba, approx. 80 km. west of Cañada de Gómez on the railroad. See maps at top. (1899 Apr) Inspected sick animals. Vet from BA? (A:1877 May) house-maid at LaCal. (1899 Dec) Visited, bought for stallions. (1890 Jan) Mentioned as “new town”, founded by the Dickinson brothers, it was incorporated into Las Rosas in 1892. Neighboring estancia to the north, east of estancia and town of Las Rosas, bought from the Munro family in 1874 by the Dickinson brothers, Henry & Alfred. The estancia no longer exists (2010), its house is derelict (about 5km. east of Las Rosas town, on the north side of the paved road to San Genaro), and its cemetery has been ploughed over. First mentioned by Frank (July, 1876), often by Alfred (1877), and LaCal. day-books: 1888, 1890, 1891, 1901. Beginning in 1888, Johnnie played polo there on many weekends. See maps at top. Founded in 1862 as a subsiduary of Lloyds Bank. In 1923, Lloyds merged it and the London and Brazilian Bank into the Bank of London and South America (BOLSA), one of the few banks to survive the crash in the 1930’s. In 1986, BOLSA was merged into Lloyds Bank. (A:1877 June) Visited, stayed overnight. (1888 Mar) Tallow man in Cañada? Visited. (1888 May, 1890 often, 1891 Jan) Visited. on several occasions; by May, 1888, he was working there as an assistant (segundo). Mentioned often, may have authored the occassional diary entry. Brother visited. Daughters and son mentioned, often without initial or name. (1891 Mar) Robert became manager for Halls near Arroyo Seca. (1890 Jan) Visited., several times. See also: Benitz, Mrs. J. See her bio pages: Marjorie Morris Macintosh (1858-1945). She later married John E. Benitz, in 1892. (1890 June) Visited, several times. (1899 Memoranda) Address listed, visited. (1888 Apr., 1890 Nov) Visited. – working there by the end of Apr’88. (1888 Dec) Hired at La California. (1899 Feb) Mentioned, town? estancia? Town in Córdoba province, on the railroad west of Cañada de Gómez (SFé), about half way to Bell Ville (Cba); approx. 60 km SW of La California. See maps above. (1890 Aug; 1891 Feb) a stallion at La California. (1899 Feb) Stallion; sold Sep.
(1888 June 2) Stayed the night. (1888 Jan) Visited several times thereafter w/Watt. (1899 Feb) Accountant for the Bz family; lived in Rosario; mentioned regularly. (1899 Feb) Buys pedigree sheep. (F:1876 July) Estanciero, east of LaCal., near Totoras. (1890 May) Owner of herds that stayed the night. (1890 Jan) Workman at La California. (A:1877 June) Worker at LaCal. Fired June 24. (1888 Mar) Worked at La California? (1891 Feb; 1899 Aug) Stallion at La California. (1888 Nov; 1891 Dec) Visited. Western Argentine province famous for its wine, capital by the same name. (A:1877 May) Mayordomo at Las Turbias. town in SE Córdoba province, north of estancia Los Algarrobos. (1890 Apr; 1891 Feb) a stallion at La California. Estancia Monterey (near Monte Maiz, Córdoba) belonged to Malcolm Cross; its management was overseen by JEBz - see JEBz’s diaries. Town (in Santa Fé) about 20 km west and a little south La California. See maps at top. (A:1877 June) Returning to the US. See Colonia California. Morando, Cesar (Caeser, etc) / C.
(1899 Oct) Buys horses (in Sep: mentioned as brother to Cesar Morando). (1890 Jan) Visited, took Rosa. (1890 Mar) Butcher in Las Rosas. Bought cattle. (A:1877 May) Visitor from Fraile Muerto, Cba. (A:1877 June) Returning to the US. (1888 Nov) Likely misspelling of B. Moyano. (1888 Apr) Cattle & horse buyers. (1891 Mar) a stallion at La California. (1890 July) Visited from the Caledonia. Owner of estancia El Rafango. Visits periodically. Had yearling cattle at La California. (1893 Jan) Went on holiday with Herman Benitz to Mar del Plata. It was he who notified La California of Herman’s death. Nash later became ill and travelled to England, followed by his wife and small children. He died there in 1894. (A:1877 May) Peón? No name provided. See black peon. (A:1877 May) Visited; later met at estancia Las Rosas. (A:1877 May) Of estancia Las Castañas. Josephine’s (de Schreiber) summer home in Cruz Grande, Cba. (A:1877 June) Mentioned. German consul in Bs.As., and owner of Ea. La Germania. (1888 Feb) Visited, from Las Petacas. (1899 May) Capataz herding cattle to Los Algarrobos. (1888 Oct. ) See Montes de Oca. (1888 Mar) Visited., recently arrived in Arg. Still there in Oct’88. (1890 Dec 22) Left for Entre Rios. Full name, likely: C.J. Wedderburn-Ogilvy. See Ogelsby, Ogilby. (1899 Jan) Mayordomo Jan-April, mentioned often after. (1899 Mar) Brothers, visit from England. Land (500 ha.) east of Las Tres Lagunas to the railroad, south of the town of Las Rosas and north of La California. Bought by Alfred A. Benitz June 2, 1909 (from Knight & Porteous), it was sold in the 1940s. See maps at top. It once was the SW corner of estancia Las Rosas, owned by William Kemmis. Neighbring estancia, its SW corner touched LaCal. 's NE corner. Created in 1938 from the southern league(s) of La Germania when the 2 daughters of its founder (F. Nordenholz) split off their share. See La Germania for more details. During WW-II, sailors from the German battleship “Graf Spee” (scuttled in the River Plate, 17 Dec.1939) were billeted at El Orión. (1890 Jan) Workman at La California, first mentioned 6 Jan.1890, discharged on the 23rd. But on 30 Jan. 2 Pachecos are workmen at La California. Estancia in the Chaco region of northern Santa Fé between the Calchaquí and Salado rivers, 30 km. west of Calchaquí (town). Used for breeding cattle, Alfred rented it 1890, bought it 1904 from the Santa Fé Land Co. (a.k.a. : La Forestal). See Alfred’s diaries & day-books, 1884-1904. Town south of La California, 20 km, about half-way to Cañada de Gómez. See maps at top. (1888 June) Mason working at La California. (1888 Apr) Visited on several occasions; (1890 Jan) Visited w/Dickinsons et al. (ii) a misspelling of Petrona. (1890 Dec) Sent by Mr. Nash to collect payment. (1895 Jan) Mayordomo at La California; played polo in BA. (1896 Jan) Mayordomo at La California, until Sept'96. Returned to England. (1888 Nov) Mentioned, “of Las Tres Lagunas”. (A:1877 May) Stayed over-night, became ill. Died in Rosario, June 16, 1877. Estancia about 120 km. north-north-west of La California, in Santa Fé next to the border with Córdoba province; for many years owned by the family of Charles Jewell. It is where polo was first played in Argentina by its manager, Frank Kinchant, with his peones - too much so, for which he was fired. Two of his polo-sticks still exist, one is at Ea. El Piquete, the other at the Los Laureles polo club in El Trebol, SFé. See maps at top. (1890 Mar) Per context, is the pulpero “at the gate”, replaced by Andel? (1888 Aug; 1890 Jan; 1891 Apr) Puestero at La California. Adept at making lasos. (1888, Apr. 5) First mentioned!! At Ea. Las Lomas; (1888: July 8+) Tournament in Rosario; (1888: July 15) Johnnie in tournament. (1901 Jan) Mentioned, see Mr. Lockhart. (1888 Apr., 1890: Mar) Bar / store. Exact location unknown but “at gate”, likely main gate to La California. – see Peter. Also see pulperia and pulpero in glossary. Large town in Santa Fé province, approx. 150 km (90 miles) due north of La California (see maps above). Estancia north-west of Las Rosas, owned by John Nash; also known as St. Catalina Rafango (22 May, 1888). See 1889 map at top, area labelled "Tomkinson Hermanos". (1888 Jan; 1890 Jan; 1891 Jan) Mentioned often. (1890 Nov) commission agent, Mercado de Frutas, B.A. (1890 Dec, 1891 Jan) of estancia Schönberg – sent steers to pasture. (1890 Aug; 1891 Jul) Likely a colono at La California. 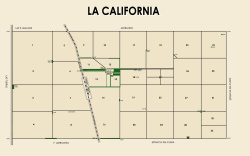 (1890 Feb) Colono at La California – per context. (1888 Feb) Colono at Las Tijeras? (1890, 1891 Memoranda) Listed, USA address. Alfred’s summer home in Cruz Grande, Cba. (A:1877 June) Met at C. de G.
(1888 Apr) Mentioned – very likely George Roberts of Ea. “El Ingerto” near Carlos Pellegrini – town approx. 50 km. north of Las Rosas. His son, also George, married Marion Benitz (b. August 1897), youngest child of William & Clara Benitz. (1899 Dec) Sold cattle to LaCal. (1888 Dec; 1890 May; 1891 Apr) Visits. (1899 Feb) Mentioned, cattle dealer? (1888 Jan., 1890 Feb, 1891 Jan) Visited on several occasions; Likely became a segundo, comes & goes. (1899 Jan) Dealer in hides, wool, etc. (1888 Oct) Butcher from Roldan, town. (A:1877) Mentioned - possibly Rocca? (1888 Oct) Town 10 km. directly west of Rosario, before Carcaraña. See maps at top. Largest city in the province of Santa Fé, on the west bank of the Paraná river, 310 km. north of Buenos Aires and 160 south of Santa Fé city. It was & is a grain export terminus. It is the closest city to La California which is 120 km. to its NW. See maps at top. (Town) Founded first as Las Lomas in 1888 by the Dickinson brothers. In 1889, William Kemmis founded Las Rosas immediately to its east; also a railroad station, it surpassed and incorporated Las Lomas in 1892. The two original towns can still be discerned by the streets: those from the original Las Lomas are aligned with the provincial plat / roads, those from the original Las Rosas were aligned with the railroad. The town is 130 km. NW of Rosario & 35 km. north of Cañada de Gómez; it is the seat of the Belgrano department (county) of Santa Fé. See its website, listed on our Relevant Links page. See maps at top. (Estancia) Neighboring estancia, immediately north of the town Las Rosas, owned by William Kemmis, 186x – 1899? See maps at top. It's SW corner became El Ombú, & its SE corner was bought by Victorio Morando. Mentioned often in the diaries: (A:1877 May), (1890 Jan), (1899 Feb) Closing sale, remate. (1888 Mar. ) Gardener at La California. (1890: Dec.9) Died. Long time worker at La California, buried at La California. (1888 Nov) Worker at La California. (1890, 1891 Memoranda) Listed, Rosario address, recero. (1890 Apr) Butcher, bought cattle. Mentioned often. (1888 Jan) Managed or owned by Mr. Robson? (1888 Nov) Town 180 km. NW of Santa Fé city, seat of the Santa Fé Land Co.
(1899 Apr) Town 20km NNE of La California - see maps above. (1901...) Mentioned regularly in later years. (A:1877 May) town/colonia 100+km north of LaCal., directly west of Santa Fé city. See maps at top. (A:1877 July) Peón at LaCal. A town in Córdoba prov. on the Rosario to Córdoba city railroad, about ¾ the way from Cañada de Gómez (SFé) to Bell Ville (Cba); approx. 80 km. WSW of La California. (1899 Oct) Town on the Paraná river, in Buenos Aires province on the border with Santa Fé; today it is a grain exporting port and center for steel plants. (1888-1890 often) A Bohtlingk estancia, visited back & forth with LaCal. Neighbour to the east of LaCal., bought by Edmundo Bohtlingk in 1886, he built his home there in 1888. Once part of La Germania, see La Germania for more details. See maps at top. Province in which La California is located. Its capital, Santa Fé city, is 475 km. north of Buenos Aires on the Paraná river (or 150 km. NE of La California). The province is named after the city which dates from colonial times. The northern 1/3 of the province lies within the Chaco geographical region; the southern 2/3 are within the pampa humeda – the humid pampas, prime agricultural land. Its largest city is Rosario. Very large land-holding (2 million hectareas), cattle, timber, and tanin company of foreign ownership in northern Santa Fé province, centered at San Cristóbal. Later became “La Forestal” - see more about this company on the web. Alfred rented (1890-1904) then bought (1904) Los Palmares from them. (1890 Aug) Patron saint of Las Rosas, rain (to end the winter drought) is anticipated on or before her day, Aug.30. Good luck! Province bordering northern Santa Fé to the west, north of Córdoba province. (1888 Nov. ) Tamer at La California. (1888 Mar) Responsible peón at La California. Also see: Antonio Saralegui y Cia. (1890 Jan) Likely a colono (tenant-farmer). (1888 Mar) Colono at Las Tijeras? See Sariote. Town about 100 km. (60 miles) north of Las Rosas, in central Santa Fé province. See maps above. In 1874, the Schiele family (from Germany) arrived in Argentina with the Benitz and Böhtlingk families, on the ship S.S. Boyne. The Schiele family settled near Venado Tuerto, SFé. (A:1877 June) Inn (? ), Cañada de Gómez. Estancia near Cañada de Gómez, owned by Paul Krell, son-in-law of William Wheeright, builder of the Ferrocarril Centeral Argentino. No dates yet of ownership. (F:1876) Condolence letter; Josephine's husband (m. 1878). (1899 June) Visited with Governess - likely the youngest, Clara (b.1885). (1890 Mar) Visited from La Germania w/Bohtlingk. Village 30 km. south of Rosario near which N. Hall owned (or oversaw) an estancia that was managed by R. Macintosh 1891-?? (see JEBz’s diaries). (1890 Jan, 1891 Jan) Workman at La California. (A:1877 July) LaCal. capataz bought cow from him. (1888 July) Worker at La California. Owner of estancia east of Nordenholz’s La Germania. Possibly partner with Nordenholz, both are east of LaCal. Sharff bought at same time as WBz. See old maps at top. (1899 July) From Santa Sofia; visited. (1899 July) Came from Entre Rios. On the F.C.C.N. railroad in Santiago del Estero. (A:1877 June) Rented land from LaCal. 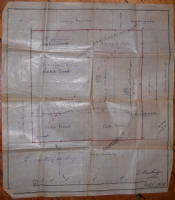 (1888 July) Bought land, from Benitz family (La Independencia). (1888 Jan) Worked at La California – apparently responsible. (A:1877 June) Mentioned, of Las Tres Lagunas. English language daily newspaper printed in Buenos Aires, 18xx-1950's. when unqualified, refers to the La California train station – see above. (A:1876 Nov) old & young mentioned, workmen. Per context, could be their horses. (1888 Mar) Visited. with Mrs. A. Dickinson. (1888 Jan) Estancia 30 km to the north of LaCal., at one time owned by the Traill family; immediately north-west of the town of El Trebol. See maps at top. Dr. John Macon Thome, an astronomer from Pennsylvania, was (as of 1885) the director of the Argentine National Observatory in Córdoba. Mrs. Thome (Frances Wall) was one of the U.S. school-teachers brought to Argentina by President Sarmiento; mentioned in “65 Valiants”, by Alice Houston Luiggi, p. 161-164; see also Clara E. Allyn. (1891 Feb) Visited from Córdoba city. (1899 Oct) Visited (as “daughter”, figures often in John E. Bz diaries). (A:1877 July) Tenant of the Dickinson brothers? Hired Kunz. (F:1876 July) Visited at Colonia Hansa, SE of LaCal. Estancia east of La California, see old maps above. 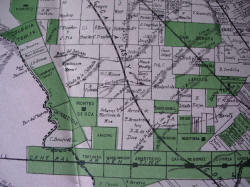 (1890 Jan, 1891 Jan) Third league / section (counted east to west) of La California. Populated with colonos (tenant farmers) during the 1880’s. Alfred received it when he and his brothers divided up their joint properties. See Las Tres Lagunas, of which it became a part. (1890 Apr) a stallion at La California. (1890 Feb) Colono at La California. (1890 Jan) – see Tomasito. (F:1876) town 40km. east of LaCal., on railroad trunk from Rosario to NW Arg. See maps at top. Town 30 km. SW of LaCal., on railroad west of Cañada de Gómez, in Santa Fé on the border with Córdoba. See maps at top. (1890 Sep) Mentioned. The Traill brothers, Robert & Edmund (later married Gertrude A. Dickinson, younger sister of the Dickinson’s of estancia Las Lomas) arrived from Ireland in 1866. The Traill estancias, Las Limpias and Chirú, are 100 km. north of La California. (about 20 km. east of San Jorge town; see maps at top). Chirú was an indian chief killed during a raid. The brothers liked horse racing, their sons preferred polo becoming world class players 1900-1925.
second town on the rail-road north of Las Rosas. See maps at top. (1888 Mar) – of El Trebol? (F:1876 July) Visited, brought mail. (1890 Apr) Arrived from England. (aka: the TL or 3 Lag) Estancia bordering Las Tijeras to the north; it abuts the south side of today's town of Las Rosas. In c.1875, it was owned by Stuart C. Munroe, later managed and/or rented by the Watt family 18xx-18xx, then owned by Portious & Knight 18xx-19xx. Bought by Alfred in 19xx, its house became his principal residence. It was divided up after Alfred's wife, Olga, died in 1963. Most of it was inherited by John Horner, most of Las Tijeras was inherited by Willie Horner, and estancia Don Alfredo was created from western portions of both estancias and inherited by Mary Horner (de Sundt). See maps at top. (1891 Apr) Loaned money to. Province in north-west Argentina known for its fruit. (1891 Jul) Peón/tamer at LaCal. (F:1876 July) Peón at LaCal. Important town in the south-west (toe) corner of Santa Fé, south of Las Rosas. a.k.a. : VT. Translated, the name means One-Eyed Deer. (A:1876 Oct) Peón at LaCal. (A:1877 May) Peón at LaCal. (1888 Mar) Town in Entre Rios on the Paraná river. Likely the estancia founded in 1866 by Gerald & Charles Talbot in the vicinity of El Trébol (SFé); sold in 1881 to John B. Flea & Charles S. Treacher. See maps at top. For more details, see Monte Buey People & Place Names. (1891 Jan) mentioned - at estancia Schöenberg. (1899) Town and grain exporting port of Santa Fé province on the Paraná river south of Rosario. Ca.1900, the Storey family lived there, friends of John & Marjorie Bz. ; see Johnie's diaries for more about the Storey family. (1890, 1891 Memoranda) Listed, Rosario address, pork butcher. (1888 May) Guest? of Josephine (mother) at La California. (1888 June) Was paid for cattle held at La California..
John Erskin Stuart ‘Cito’ Watt (elder brother to Al Watt, married to Hattie Benitz) was killed by lightening in 1904 while riding a white horse in northern Santa Fé or Chaco. (1888 Feb) Visited on various occasions, & stayed the night at La California. (F:1876 July) Visited, of estancia Las Tres Lagunas. (1888 Mar) Visited, stayed the night. (1899 Nov) Called w/Mrs. Böhtlingk. (1891 Jan) Visited w/Mr Nash. Wilson Sons & Co Ltd.
(A:1877 June/July) Mentioned, at Las Rosas, see Mat Whish. (1888 Aug) Mentioned, “a german”. (1890, 1891 Memoranda) Listed, Estancia Fortenzuelas, Veria, F.C. Oeste, BA.